K. A. 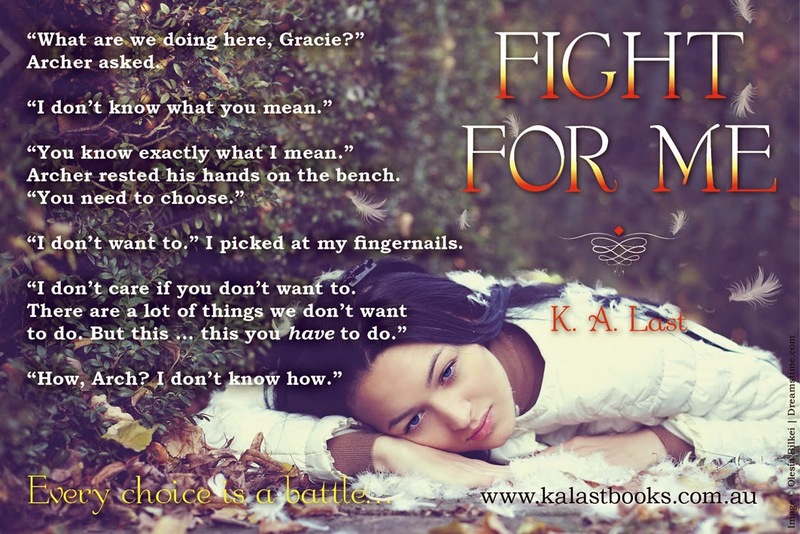 Last: Fight For Me is Finally Coming! Fight For Me is Finally Coming! Wow! It’s been a while since I posted about anything to do with my books. Things have been crazy busy for me and time has disappeared into the abyss. The next instalment in The Tate Chronicles is on the road to publication. Fight For Me will be released into the world on January 17th 2015, so the next few months are going to crazy busy as well. I chose this date because it’s the same date Fall For Me was published. If you’ve been following my journey here, and on Facebook, you’ll know that Fight For Me was a hard slog to write. It took me much longer than I anticipated, and releasing on the second book birthday of Fall For Me just seemed like the best option. The cover reveal for Fight For Me is set for November 14th, and I’m very excited about this. The cover is almost finished, and I can’t wait to show everyone.